"Windows could not parse or process unattend answer file [C:\windows\Panther\unattend.xml] for pass [specialize]. A component or setting specified in the answer file does not exist." 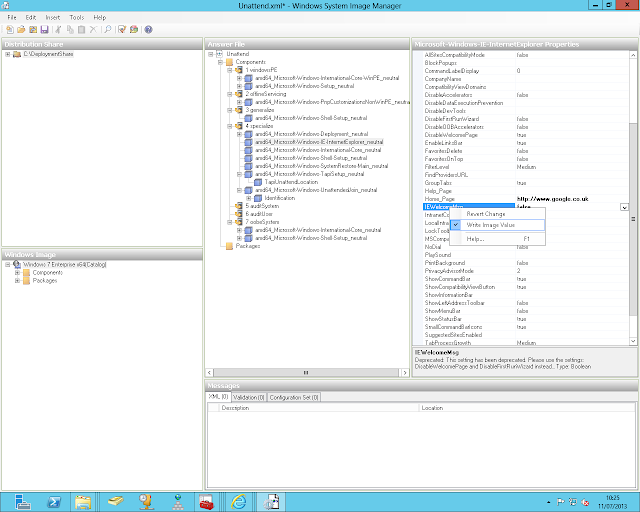 Alternatively, you've just made a new MDT Task Sequence and slipstreamed updates into it and received the same error. Windows has encountered a problem, press ok to restart. The cause of this is simple, it's internet explorer 10.0 which you have installed either within the image or slipstreamed into the image. 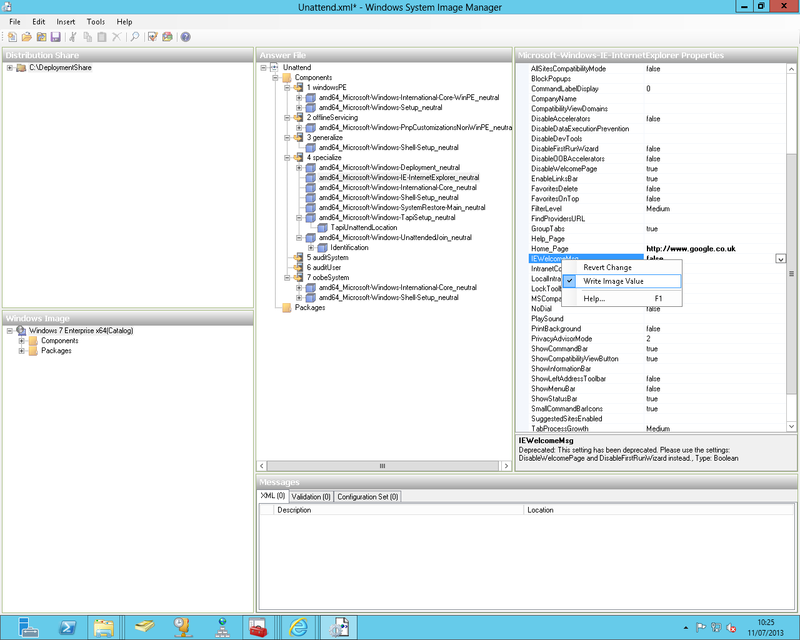 In your MDT Deployment Workbench, go to your list of task sequences. Right click the task sequence you are using to deploy out your new image with IE 10. Go to the properties of this task sequence. Choose the OSInfo tab and click "Edit Unattend.xml"
The Status should say false, if it doesn't make sure it does. Having spoken with some of my colleagues I have ascertained that by using MDT 2013 they have not encountered this issue, however if you need to maintain support to deploy Windows XP images then you will not be able to upgrade. Thanks for the post. I've been trying to work out what was going on. I'm going to try this out. Then I'll let you know the results. I've been trying to update our image with Office 2013 and IE 10 along with all the updated available to August, but kept on getting as described above. Yeah it worked a treat! Fantastic stuff. Thanks for the feedback, glad to know it worked. Yet another reason I hate Microsoft. They made IE 10 part of Windows Updates but did not test it enough, and did not have any information on this error. Good work MS. Fantastic! Works a treat thank you so much, it's been driving us insane!! Gotta love step by step solutions. Thanks for the fix, why could they not go with a silent fail rather than crash Windows install. This was also happening to me on the capture task as well. This is a huge bug and might I add time wasting issue. Trying the solution now, if it works this should be front page news. These settings worked for us, thank you so much for sharing! I had to delete that entire line from the XML file on the Deployment Server in the Task Sequence for the image being deployed. Daniel can you tell me where exactly or how you deleted the line. My xml file already reads false. I'm kind of new at this so I'm not sure where to delete the line you are refering to. I know you can add a post step but not sure how to go about it. Worked great, thanks! After reviewing logs and xml files over and over I didn't find anything that would even remotely think to change that settings. Great post. Thanks very much! I had used this old guide to start using WDS, and quickly realized that I should roll updates into my reference image. I ran into this exact problem, something that the MSFT Accelerator team should solve themselves! Thanks! Didn't work for me get an error when trying to the Edit Unattend.xml "unable to generate a catalog for an x86 operating system image while running on an x64 operating system. Retry the operation from an x86 operating system"
That is correct Brad, in order to create a catalog for an x86 wim you will need to add the adk to an x86 Windows 7 machine. Copy your new wim file to this machine and you can then open it in the wsim tools and generate the catalog from here. Once you have an updated catalog you can place this in your deploymentshare in the same folder as your wim file and you will be able to edit the unattend.xml from the osinfo tab. Marc, any chance we can see a post on this in the near future. It is an absolute pain since all modern server operating systems are x64 only. There are still some occasions where I need to push out x86 (processor limitations etc) and ideally want them to have IE10 or higher. I will look into writing a quick post on this in the next couple of days (work permitting) My advice would be to build a W7x86 VM and use this to generate the catalogs. If you are licensed for Server 2012 Standard or higher then you will have licensing to run at least 4 machines on the license, this could include your host machine and then running Hyper-V with a W7 x86 machine within it. Alternatively you could take a snapshot of your machine just prior to running sysprep, take your capture image and then once you have a wim you could revert to your pre-sysprep snapshot and install the adk onto that machine then generate the catalog here. As promised here is a brief document outlining how to create your own x86 .clg file. My MDT server is on a VM x64 system, so I won't be able to do that. I'll just have to recreate the Windows 7 image and remove the IE10 update before I do the Capture part. Any information on IE11 into an image? Will I need to do this fix for that as well? We are building a new image next week at our high school and unsure whether or not to brave IE11 for Windows 7. Thanks. We have not tried IE11 just yet, I imagine the IT Magician will have a post in the very near future if there are any issues as he has a little more time to play with these things. IE11 doesn't work with the unattend.xml As far as I have tested. But I couldn't figure out which setting makes is corrupt. I just wanna say that in MDT2013 it still can be som trouble with this error message.. Thanks!!! After trying different solutions and spending time figuring out, your solution worked!! Thank you. This worked great for me. And thanks for letting us know that it takes a long time for the catalog file to build otherwise I would have thought it was hung up (took about 45 minutes). This still works for me with IE11 and Win7. Have to untick that value on every image I capture, but it works without fail.